Includes jumpsuit with attached armor, utility belt, 2-piece helmet. Gloves and shoes are not included. Put on Stormtrooper helmet and become part of extended intergalactic family. Empire is looking for white soldiers and if you can fight against rebellion then you the one. Are you a big fan of Star Wars and its warrior characters? 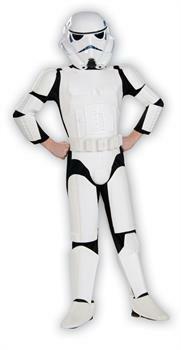 Then go for Stormtrooper costume. Imagine your boys in the coolest ever costume and you will find same here. Boys got huge imaginations and creative minds. They look for same in their party costumes. Get into your favorite style with Stars Wars Storm Trooper Special Edition Child costume.